A classic winter outer layer designed to bring a versatile mountain look and natural warmth to your everyday life and post-adventure pursuits, the Stratus X Jacket is as stylish as it is easy on the environment. The Stratus’ 100% recycled polyester shell is not only durable and eco-friendly, but it features a DWR finish that sheds wind and light precip during variable winter days. Inside,Icebreaker used their innovative MerinoLOFT™ insulation, a sustainable and high-lofting alternative to synthetic fills made from all-natural merino wool (up to 10% of which is recycled), which retains warmth when wet and naturally helps regulate body temperature.Icebreaker also lined the jacket with 100% woven merino wool for incredible next-to-skin softness. With classic alpine style cues, zoned quilting for thermal regulation, and front and internal pockets to stash your small daily essentials, the Stratus is a go-to choice for cold days around town. 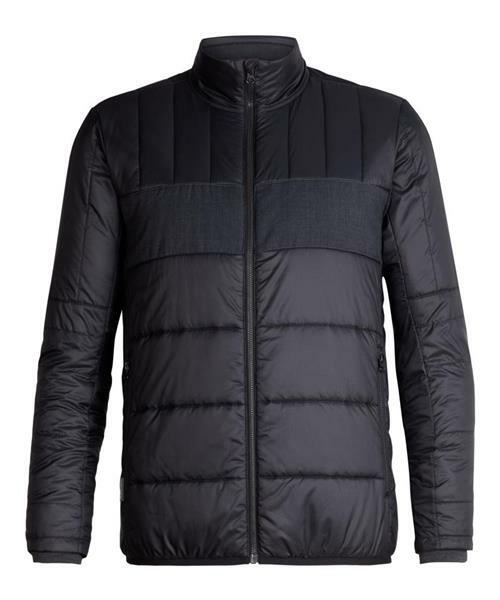 Stratus X Jacket- Mens is rated 4.8 out of 5 by 12. Rated 5 out of 5 by skibum4 from first climb Fits in a small back pack to change at the top of the mountain after a climb with touring skies. Used it for the first time at temperature of -25 degree Celsius. Was all wet at the top, changed the mid layer for the stratus and was never cold during the way down. Great gear!! Rated 5 out of 5 by Merinofan77 from Lightweight and Warm This is lightweight yet very warm. I have worn this jacket in a range of temperatures from -8 to -25 and with moderate changes to underlayers, I have stayed very warm. Love the extra length of this jacket to cover my lower back and not ride up with movement. Rated 5 out of 5 by Gzhao from MR. Light and warm, good as either outwear or inner layer! Rated 5 out of 5 by MalcolmJS1973 from casual jacket that looks great purchased to augment the longer jackets in the closet - great winter jacket when you don't want/need the length. Rated 5 out of 5 by KAAT from Super warm! Super warm but also really lightweight. Very comfy lining.